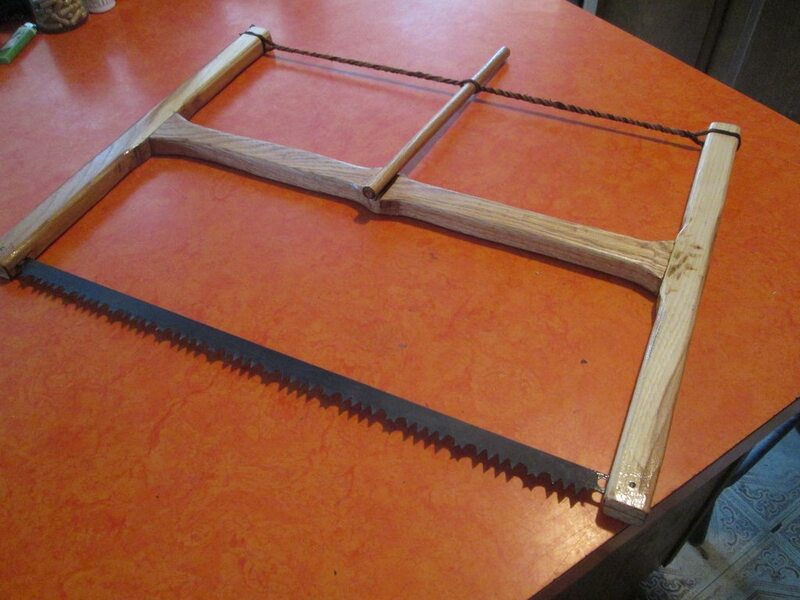 We made a couple bow saws yesterday they`er kinda neat, found another picture of a unique design we`re going to make today. Classics, Pitchy. Amazing how efficient they are with a decent blade. Thanks fellers, here`s the one we made this morning. Dunno why but that grip shape suggested "rubber band gun" to my aging baby boomer mind! Thanks fellers, it gives the impression more of a bow also which i take it is where the name comes from. Thanks buddy, now on to the next project. Nice job Pitchy! I have two in the barn but must confess I don't recall ever using one personally,. I did use a 30" Swedish metal bow saw when I was 10 years old or so. Dad would send me to limb with the axe and bow saw the trees they dropped. Thank you EdinCt, yep the good old days when one was in good shape had to be. Me too -- is that a "bump saw" ? ? ? they`ll probably confiscate it because it spits out to much saw dust. 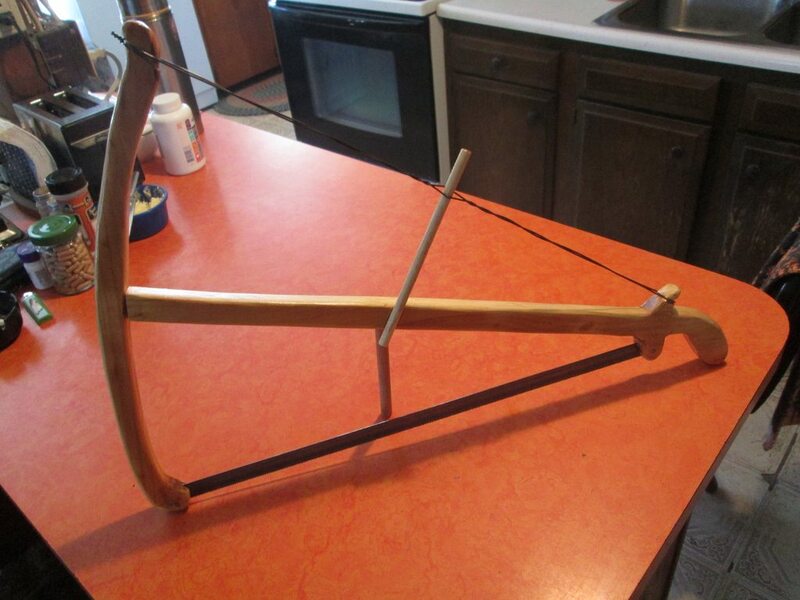 Found the old metal bow saw i`ve had for many years and refinished it. 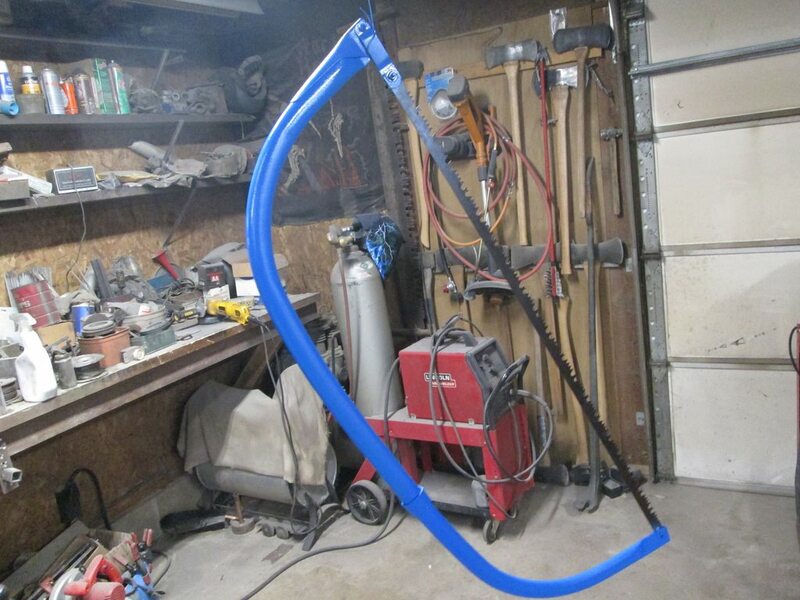 This one might of been red at one time but blue is all i had left, this is a 42 inch blade. I have one of the small ones too they are handy, that and a light axe. Good looking old saws. My Grandfather used to have a saw that my Dad called a misery whip. Dad said that you had to pull or it would whip you. A man on each end. Do not push, each takes a turn pulling. I was told that it would cut a lot of wood if used correctly. People my age or younger seem to be more into instant gratification and less effort nowadays. There are still a few who know how to work, but it is becoming rare. Mine I lost during one of 3 overseas moves. It was a commercial unit, and the blade could be rotated 90 degrees to the frame. I once ripped a 1x6 in half with it just to see how that went, which was a mild work out. They are a good tool. I should get another one. Most wood I cut I still do with a hand saw. When I need to destroy an unwanted sheet of wafer board or the like, out comes the circular saw, though. Nice selection of axes you have there, too, Pitch!